Industrial production was unchanged in February, the Federal Reserve reports. That’s bad. 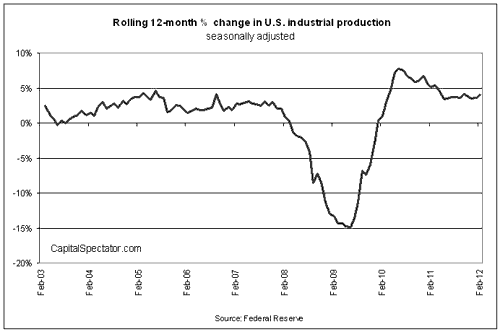 But the year-over-year pace for industrial production rose slightly—that’s good. The flat report for industrial production last month may be a sign of trouble for the economy, but if it is it’ll be a hazard that will soon send a clearer warning through the 12-month rolling change for this series. But after today’s update, the future is still open for debate on that front. Recall that one of the factors that persuades the Economic Cycle Research Institute to maintain its recession forecast (first announced last September) is the weakening trend of late for industrial production. ECRI’s co-founder Lakshman Achuthan yesterday explained (before today’s update) that part of his firm’s dark outlook is bound up with the fact that “growth rates of personal income and industrial production have dropped to their lowest readings since the spring of 2010.” Does today’s report inspire a fresh take on that indicator’s signal for the cycle? Maybe. At the very least, the latest data point keeps the dialogue going on where the economy is headed for the rest of the year. Consider how the 12-month percentage change for industrial production fares in recent history. For the second month in a row, the year-over-year change turned higher, advancing 4.0% for the year through February vs. the 3.6% annual change in the previous month. Definitive? Hardly, but marginally better beats continued deceleration. It’s true that industrial production is still growing at a relatively low annual rate compared with the upper ranges witnessed over the last two years. But it’s not obvious that 4%—above the roughly 3% average 12-month growth rate for industrial production since 1960—is an unambiguous warning for the economy, assuming it holds. What is clear is that if a new recession is here, or set to pounce, industrial production’s annual rate is destined to go into freefall. Anything’s possible, of course, and a sudden drop from a robust growth trend isn’t unprecedented in history when recession risk mounts. But for the moment, at least, the year-over-year rate looks a bit more stable. Consider too that consumer spending’s trend perked up a bit on a 12-month rolling basis too in February, based on the latest retail sales report. That’s encouraging in light of yesterday’s update on new jobless claims, which continue to suggest that growth will roll on in the labor market. Nothing less is required to stabilize the recent deceleration in income growth and tip the argument towards anticipating the expansion will roll on.